More thinking, less drawing. At least, that's some of the advice Alex Toth would toss around. And I seem to recall Norman Rockwell saying something very similar in his autobiography. The most satisfying final pieces are less about fancy brushwork or pretentious camera angles and more about an original, powerful, or truthful concept behind the drawing. Those core concepts can't be found by subdividing a certain visual ratio or crosshatching a certain way. They can only come from thinking. 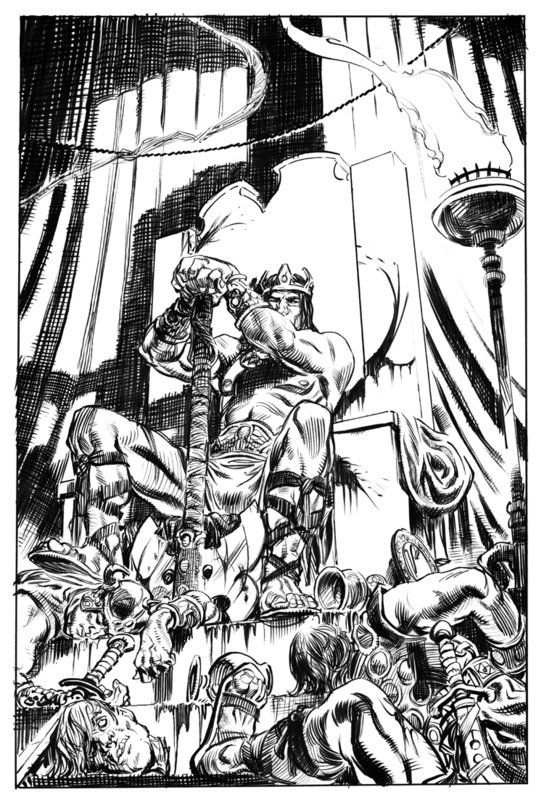 Which sort of happened with this Kull piece. Most folks know about my undying love and respect for Robert E. Howard. My gallery on Deviantart is littered with images of Solomon Kane and Conan. But, I'd never drawn Kull before. For my first time tackling the Atlantean I thought it'd be appropriate to show him in repose, sitting on his throne with his axe in hand or nearby. A couple of months ago I started a few sketches, but none of them seemed very exciting or unique. I put the idea in the back of my mind and shifted to working on other things. Then, a couple of weeks ago, after a 12 hour day working on sequentials pages, I mixed myself a gin and tonic and sat down to draw something just for fun. As I walked over to the drawing board I had Batman in mind, but ol' King Kull showed up instead. He was sitting on a throne, seen from below, and with dead Valusians all around. His face was obscured by his massive arms. Hell, those arms and the axe handle are what's really important, not his face. Because the core of the drawing, the moment captured, is not really about Kull as a particular character or his particular motivation. It's about violence and the relationship of violence to political power. And, because I'd been subconsciously working it out in my head for weeks, it took less than a minute to draw.